Inquisitors! We have arrived at the first bigger milestone on our development Roadmap, and here we have a massive content update (0.2.0) with plenty of new gameplay features. But, as you have been warned at the start of the Founding, such a fundamentally new build requires new characters, so... your accounts, characters and progress will be reset. It will hurt a little, but you should get used to the feeling during the Founding. It's for the greater good: these new features will transform Inquisitor - Martyr as you know it. See their descriptions and don't hesitate to try them out in action! As usual, we're very eager to see your feedback, so we can improve the game further. If you want to get the best loot in the game, you don’t need to grind endlessly: you can also play these special missions for neat rewards. Since these missions are very important, we didn’t want to drop them randomly, so we came up with the idea of mission crafting. These are the “Uther’s Tarot” missions are assembled by the players using Fate points and special Uther’s Tarot cards. Uther Tiberius is a significant character in the background story of our sandboxed Sector and you are going to assemble his unique heritage, the psychically active Tarot decks based on his designs. These decks can be assembled by collecting cards in the open world on the Star Map, and every new card will open up new opportunities in mission crafting. Major Arcana are used to determine the type of the mission, Minor Arcana will give new challenges and parameters. Our goal is to let players assemble their favourite type of missions with the conditions they like the most, but also to give some sort of control to the players in what kind of loot they want to get. Note: This „controlled loot drop” system isn’t fully operational just yet, so this will have some limitations in the Tarot system right now. Once this feature is fully realized, the system will also take your current equipment into consideration, what kind of skills you’ve unlocked, and the locations on the Star Map, these will modify or specialize the loot drop chance as well. We wanted to make random mission grinds a bit more interesting, so we have the Investigations. We should emphasize that this is not the story based campaign and not the story of Events, so don’t expect that level of depth – those will be uniquely written stories. With the Investigations, writers are limited to work with a modular narrative that takes your choices into consideration, but is a randomly generated mini-campaign nonetheless, taking place on the Star Map. The Investigation features and possibilities are currently still under development (this is where the Puritan / Radical morality system will come into play), and as we finish perfecting the base mechanics and add more content, we’ll add more narrative modules as well. Power levels are basically more advanced and structured form of item levels, and an individual difficulty setting for the open world missions on the Star Map. Is the game too hard? Try to play on a Power Level below you! Too easy and you want more challenges? Hit the higher Power Level, develop your character faster with better rewards! This is an open world, so you can do quests wherever you like in areas where you’re comfortable with on the already discovered and traversable parts! These are passive skills, but the main difference to the skills on the skill tree is that Perks provide not only bonuses, but they alter gameplay mechanisms as well. These are powerful boosts that affect your build significantly. You can configure them outside of battles any time. Leveling up your character is a relatively short progression compared to other ARPGs, and soon it will be extended to Account Leveling, which has a great role in this game. Account level bonuses will carry over to all of your characters who have reached their maximum character level. Or, we could say, ”Crafting, Level 1”. This is the most basic crafting feature in the game, more complex systems will be built upon this. You can use Blueprints to craft new items by disassembling old gear, so this is a very basic, familiar method. But soon it will be updated, and you will be able to re-skin your gear, and later you’ll be able to modify and enhance equipment, salvage blueprints, refine materials and create catalysts from these materials, adding more slots, modifying enchantments, enhancing relic-like items, etc. Our goal is to let players have the basic crafting system when they start the game, but if there are players who like this feature and want to immerse themselves in it, we open up a more intricate, specialized system similar to those from MMORPGs. The Inoculator, in game terms, is a both a device and a booster skill that you can customise. By combining the various available components you can set up what your Inoculator does – it can be used for healing, buffs or active skill modifications, so this is basically skill crafting. Weapons and attack skills are a given, but we didn’t want to tie healing and booster skills to certain items or skill trees. This is a modular system where you can configure these skills in a skill slot to match with your playstyle, however you like. Healing, regenerating, combat boosts, protections can be combined with components, of which there will be a limited amount at the start. Components can be collected on the Star Map. We have unlocked Inoculators with two slots, so far, but you’ll be able to find 3 and 4 slotted ones as well, so you’ll be able to combine components in a great number of variations. Change: Mission XP reward: mobs don’t give XP, you’ll get the fixed amount in the end. If you fail the mission, XP reward will be calculated based on the progress you’ve made. Change: In Hunt missions, now you must defeat 1 Elite and 2 Commander groups instead of 3 Elites. You can’t invite players if the party’s full. At the start of the mission, there will be a zoom animation instead of going to the loading screen immediately. In Bunker Busting and Silence the Guns, towers were switched back to idle by turning them off, now they play the right animation. That would be all... supposedly. Let us know what you think! Great update Neocore team. After a grueling day of work I was finally able to get on for a couple hours and I am quite impressed. The increase in challenge was desired and along with it rewarding, esp with the tarot system implemented, Investigations were fun and I like the ability to change load-outs between the parts of the investigation. The updated inventory window with a true representation of our characters is great giving us a clearer view of changes. Even managed a play with crafting a bit and while it didn't work initially for me, upon relog my beast Plasma Cannon was waiting for me and needless to say I took it on a rather enjoyable purging run. Although quite basic at present the crafting system looks rather well put together and I will be looking forward to getting into the full crafting system at full release. Although I was only able to get on for a couple hours with work and kids/wife taking up most of my day, I rather enjoyed both the new and improved parts of the update and to be honest I am enjoying this Alpha more than I have enjoyed many full release arpgs which is saying something seeing as it is my favorite genre and I have been into the 40k Universe since it released in the 80s. (So this game is win win for me). Again Great work, looking forward to what comes next. Armor upgrading with armorplates for more physical def / upgrading with holy textÂ´s for more Warp/Poison/Fire etc. resistence. I'm glad the Assassin is finally playable, but I still have rather large concerns about this game. In particular the complete lack of starting missions. Despite starting new characters over and over to attempt to shuffle the starting missions, and no clear indicator on the mission as to what the difficulty level is, I've been repeatedly and consistently given missions obviously designed for "higher level", better equipped characters. This is a problem, especially when your hitting the wall right out of the gate. Rather than have the missions get difficult over time, or more difficult the more players you have, the game seems intent on forcing coop if one has any hopes of completing any of the missions. Don't get me wrong, I love a coop game, but forcing it in order to actually be able to play the game is absurd. New comer to the forums but I've been keeping my eye on the development for this game for a while. Uther's Tarot has the potential to be an absolute game changer, pretty keen to see how that develops. With that said, the most exciting fixes listed here are in the other Other Fixes list. Quality of life changes such as not being able to invite when in a full party & the game freezing less...this is where a game gets it's "polished" feel, in my opinion. Reconnect sounds like a winner, too. First of all, awesome update. I'm looking forward to seeing where the crafting system will take us. 1. Will there be a chance to choose your Ordos later on? 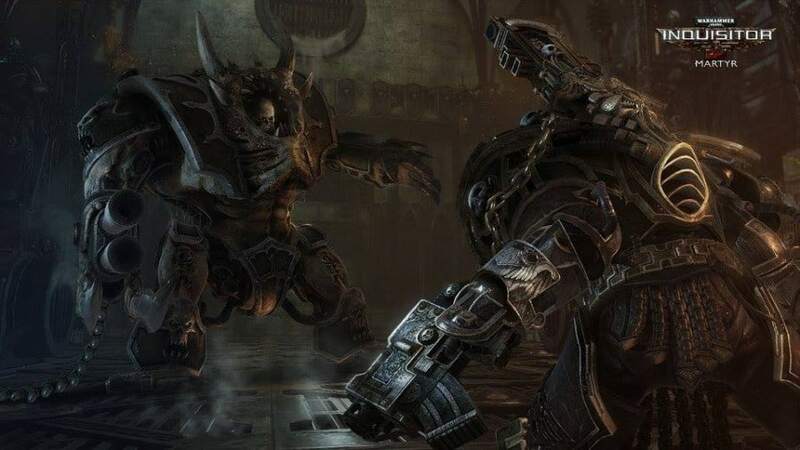 I'm hoping that we're eventually going to meet other foes than chaos, and when that happens, will we have the option to chose to be an Ordo Xenos, Ordo Hereticus or Ordo Maleus Inquisitor? I'm thinking this choice could affect what type of missions one would have access to, what foes one goes up against, and such. 3. Please give us an option to use something else for the camera angle than the middle mouse button. The middle mouse button is something the devil thought of while sitting on the can... Also, would it be possible to zoom in, to change the angle of the camera so that one was looking over the inquisitors shoulder? I'm not saying this would be the optimal way of playing, but it might resolve the issue of the camera angle when the inquisitor is backed up against a wall. instead of looking straight down at him, we might see things from closer to the characters perspective. I'm absolutely loving the game, and it is a pleasure being a part of the alpha test to see it develop. U can bring us as much as possible Bugs, to fix them later. The only important Thing is, that the game is nearly bugfree at release! This will be a huge patch so that's why we need more time. Feel free to join to our Discord server, where you can chat with us if you want. Btw, this: ' i think if not before easter, we will defo release it afterwards. question is, will it be ready for this week' is just our opinion. It's not an official answer. If we will have an official release date for the next patch, we will let you know here. Dev's said on discord " i think if not before easter, we will defo release it afterwards. question is, will it be ready for this week" So keep your fingers crossed that they can push it out this week. That's just typical I hate when devs have an official channel but the information always comes from anywhere but here... Yes I'm salty because there is no reason for me to play this game I can't use the construction because that is borked and I don't get the challenge thingies that gives me points to play the card missions. so it is blue, yellow and green galore. I know this is Alpha but that excuse you can only use so many times before it gets old. And add to that the devs have stated on several places in these forums that they have fixed the construction bug on their end and it will be fixed when they at their own leisure decides to release the hotfix.... I am not alone 90% of the player base have the same friggin problem. I really hope this is not a reflection on how it will be when the game is finally released. Any news about a new Patch? This Depresses me as well....I knew I was staying away for a reason! Got the game last night and even in that early state i love it so far. Camera rotation via middle mouse button is the only thing i don't like. The rest is solid and i have a blast playing it! Can't wait for new updates and more content in the future! TY For the Great update Neocoregames, Keep them coming. I Stream Inquisitor on my Youtube channel and receive good feed back on the game and the 0.2 update. I cant wait for the new Assassin class to drop. Will the next patch bring perk icons, to replace the place holders? Once again keep the patches coming and great work thus far! Great work so far team. An ARPG WH4K is a dream come true for me. My favorite genre and lore all in one. I play all the RTS variants just because I'm a huge WH4K fan, but I'm not an RTS fan so this is great. Thanks for taking this on. One change I would like to see is the salvage layout. The salvage button should be closer to the inventory slot or make it shift+click. It's a long trek from inventory to salvage button for those of us with 21:9 screens. We've already fixed that I think. Coming with the next patch hopefully. Yeah confirmed that tonight, relogging updates current fate amounts. I have to log olut and back in to update fate. It won't let you spend what you don't have just doesn't update continuously. I think the Fate numerical representation may be bugged I had 290 fate indicated however upon trying to set up a Tarot mission at a cost of 95 I was informed I didn't have enough. Ill try to confirm this over the weekend. I did see in the in-game chat that a couple other players had issues with Fate not seeming to be awarded numerically but they could spend fate that wasn't indicative of what they had. I had an occasion where I didn't see any deductions to my fate after setting up a tarot mission. Ill also have to check the bug tracker tonight to see if is an already known issue. Bought the game today and most impressed so far. How nobody hasnt covered the Warhammer universe in a RPG game before amazes me. My only real gripe so far is as mentioned earlier the camera angles.I find the whole system a bit clumsy and slow and just pretty awful when in combat.They should float and follow you around as in games like Diablo 3.The cameras at the moment are in between a 3rd person shooter and a 3d isometric. You cant as the player see far enough in front of you so as to plan your strategy of how to clear a room as overhead walls get in the way. Any way moan over and i look forward to the next update. Love the new update it improved game play and fun factor. I like the crafting and just found my first schematic which was a nice surprise. Just a few issues I have. 1. Camera angles and rotation. Only being able to rotate with the middle mouse button slows the game down and makes it difficult when in contact or turning a corner or entering a doorway. Having to stop moving or firing to turn the camera is a bit annoying. It would also be helpful to rotate the camera up and down to see whats in front of you. You get weird camera angles when turning corners or entering doorways and it is very difficult seeing enemies. 2. Im not a fan of the backtracking on some of the missions. The way the map is laid out makes you go one direction to kill everyone then you have to turn around and walk all the way back to the other side of the map. how can i change power levels of missions? When you finish a missions objectives a box appears to accept or decline leaving the map, but you can't decline as far as I can tell. After a minute or so you get booted back to the bridge. Can this be changed or fixed so we don't get booted out of the map? Then I don't have to worry about finishing every objective when half the map is still left to clear. Few bugs, but 100% improve from the alfa 1. Holy Emperor is proud. Don´t fail Him. 2: When you comepleet a mission you dont seem to gain the glory or Fate im not sure if its intented maybe Glory is something other than fate but it still have the same icon as fate. 3: Another thing i have noticed when you doo like Challenge level 3 missions you still get loot as you did Challenge level 1. Very nice job, again! I'm instantly forgot the lost characters when saw the new features :) The Tarot is awsome. Crafting, investigation, auto loot... This patch is huge! Way too much to be happy about, really! Just a couple of things, the disturbances of the warp.. The Space Marine killing quest is stuck, still zero after a lot of kill. In the chat, i can't see any names, and sometimes my comments are invisible. The tarantula turret much better, but still, in a lot of situations, just standing idle, doing nothing. The grav gun improved, the asound is great. But still no animation of the 2nd skill, and the first is funny sometimes. And barely saw any Silence the guns, or bunker busting quests. To be precise, 0. Oh and the map generator is not at 100%, if me not mistaken. Get the same map 3 times, one after another, everything is in the same place, even the mobs. Minor stuff, the game is still awesome! Keep it up, this will be a really 40k stuff!! I've got the feeling, just from this little taste we've been given, that the crafting is going to be something special in the end. I'm very eager to see where this is going - good work devs, and really glad I got in on The Founding. I think this is going to be THE 40k game a lot of us have yearned for all these years! Great Update guys i love it. finally higher challenge levels than 1. I have found a couple of BUGs. 1: When you have an Incubator with higher capasity of 10(5 uses if you have 2 Healing slots) you still only get the 5 uses even if you should have more. Like in my Example I have an Incubator with 2 slots a Healing and a Joker and the Cap is 16 So i should have 8 uses on it. but still only have 5. and when you get a med pack from a chest i have 10 if i havnt use any since i entered. i have also had 15 at one point but when i enter a new map its set back to 5. 2: When you make an Investergation you dont seem to get the Credits and Glory from each map you complete. im not sure if you get EXP or not. and what was also wierd was i got the investergation in a challenge level 2 area but it was level 1. I like the changes made so far to the Flamer and Melta, now they are much more useful and not overheating so fast! Is it me or is the character more squishy than before, did you change something or is just because the starter gear? Yesterday I crafted a few weapons but I can't claim them. bottom right shows, boltgun (finished) but it does nothing when I click on it. I really like the progress you're making with this game! And ditto, love where this is going...keep it up !! I had a notepad with a list I was planning on testing out and making mention of them if they were still present... though the majority were dual wielding. There were still like a couple more haven't been able to test out but it seems like the rewards aren't in the negatives once attack and defense power was fixed if i read the patch notes correctly and also the uncompleteable kill 50 champions (either no champions are in yet or wasn't working). "Mission: Silence the Guns (one time could interact with guns but cannot disarm them)", that is what I had written down for that. -Targeting door frames instead of heretics was perhaps the thing that got me. We as the alpha testers are/should be here to help find and report these things. OK, first read, than complain. Sounds like a very nice update. I just logged in for testing and sadly noticed that all my Characters were gone. Does this happened to someone else or was it planned due the new skill system? Played one Char till lvl 10, not that much, but it was something. Nice an upgrade from 0.1.7 since yesterday i see. Looking forward to testing it all out. *Is the chat tab currently bugged in game as it does not seem to be showing player names and looks stretched out across the tab causing some words to not show etc? *Anyone else not seeing any "key bindings" for all keys after W,S,A,D in the options menu? This has left me unable to reconfigure any key bindings in game, also in addition the change to the "take cover" and "hold position" keys (that used to be the same key) took me trial and error to figure out due to the above issue. Very nice whit the new thing to explore, do you plan to set a timer to crafting so one can check upon when its finished, or would that just complicate things? "Praise be to the Iron Messiah". It has been fixed, the upcoming patch will contain the fix. crafting isn't working for me. i put the ingredients needed in, click begin, and it resets with nothing happening. is this intended? or am i just SOL?